Lovely lazy Sunday lunch with Jude, Fiona and Chris. Champagne to start to toast Fiona’s birthday , then Christophe Pichon’s Condrieu ( stunningly good) to accompany the asparagus with a herb and anchovy butter sauce, then Solitude’s “Cornelia Constanza” 2010 CDP ( 100% Grenache) to accompany the Guinea Fowl and” ratte” potatoes with ceps - then a Villeneuve CDP 2013 to go with the cheese board- as near to a Burgundy as a CDP Grenache gets. Good day , siesta well deserved. We enjoyed tasting Pablo Hocht’s first ever white wine vintage (2018) at the bio-dynamic tiny estate he runs just behind the village of Seguret - Domaine Creve-Coeur. Before he struck out on his own Pablo was employed by Louis Barruol at Saint-Cosme as his “Chef du Chai”- and there is more than a little inspiration I know from the Saint-Cosme white Cotes du Rhone/IGP that I like so much - in particular the magic ingredient of Picpoul. Pablo’s white is made at Cotes du Rhone Vilages Seguret level and was intended to be a Viognier/Marsanne/Picpoul blend but as a result of the pour yield of Marsanne last year it has ended up being a highly unusual ( possibly unique?) Viognier/Picpoul blend ( with just a dollop of Marsanne) - so a great combo of aromatics and fat from the Viognier with citrus zesty notes on the finish from the Picpoul. Felicitation Pablo…we like it! 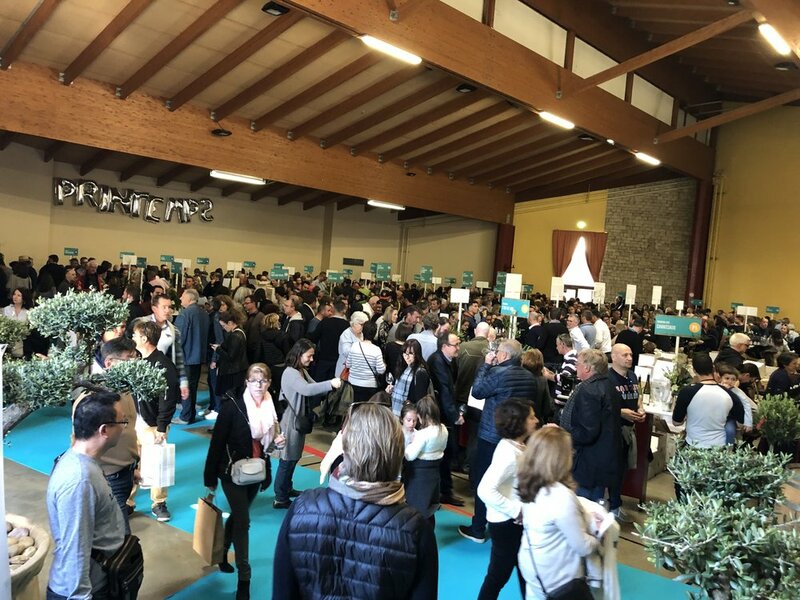 They say over 5000 wine fans are attracted to this salon/dégustation event at Chateauneuf du Pape held over 6/7th April - more than 80 vignerons showing their latest vintages including many 2017’s. It was a great opportunity for me to catch up with old friends ( Florent from Solitude/Fred from Jaufrette/Daniel and daughter Fanny from Mont Thabor) as well as make some new contacts - had some productive chats with both Chateau Fortia and Clos Saint Jean - would not be surprised if some tour visits weren’t on the cards for later this year. The catering arrangements this year were a real plus - enjoyed a delicious “assiette grillard” ( with grilled duck) in the marquee following my tastings. Nice day out. 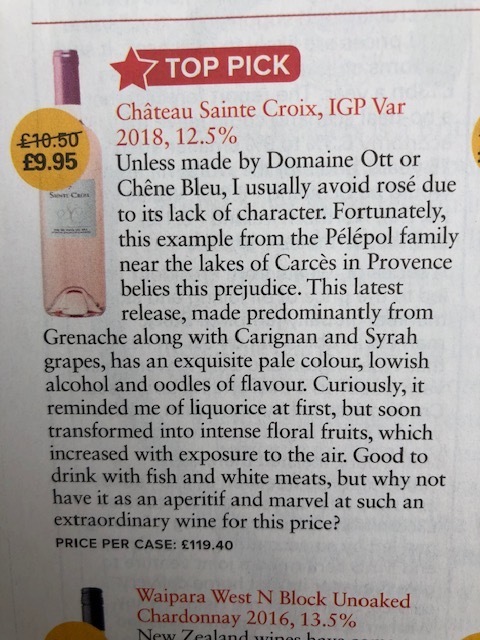 Spotted this in my copy of “The Week” this week- Bruce Palling, their wine editor promotes a selection of wines from around the world which can be bought through the magazine: from his comment around the rosé selected, seems our very own local “Chene Bleu” rosé is being talked about in the same breath as Domaine Ott ( surely the world’s most expensive rosé - the favoured tipple of many a Saint Tropez yacht owner). Not saying Chene Bleu doesn’t merit this recognition- many of my guests will know I select it as a lunchtime wine when we are at Verger des Papes at Chateauneuf du Pape where it is a staple on the wine list- its an undeniable class act - but just a little surprised at its elevation to the “peerage”here! Congrats to Nicole Rolet the owner and her team. Off the wagon and onto some delicious wines - last night in the company of neighbors Edwin and Janet Glasgow - and to accompany Jude's roast Guinea Fowl - Jacquesson 2000 Champagne, Rosier Condrieu and Roger Sabon Prestige 2004 = heaven! Been spending a fair bit of time in the Northern Rhone of late - had a lot of fun, met a lot of “sympa” winemakers - but oh my God are these wines wickedly pricy! Most top end Cote Rotie/Hermitage is beyond my usual budget and Condrieu/Saint-Joseph/Cornas not far behind. 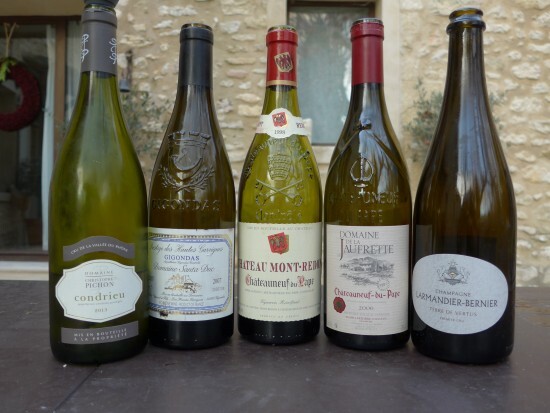 Us Southern Rhone wine fans are thoroughly spoilt by the terrific price/quality ratio we are used to….even if we shop at Chateauneuf du Pape. However, increasingly it seems NR vignerons are creating economies of scale by introducing entry level wines ( at IGP/Vin de France level) to their ranges at modest prices - €10 to €15 is typical. These are from vines planted usually on the plateau above the hills , or on the flat near the river. 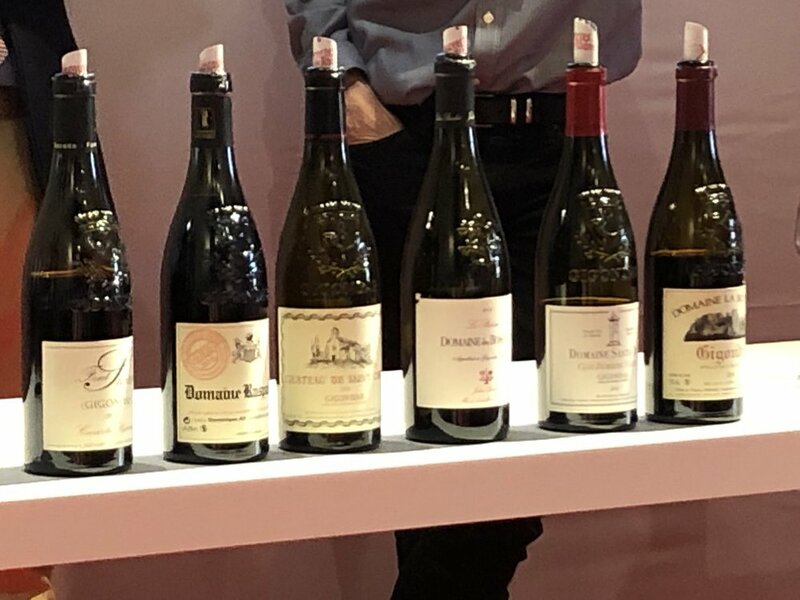 Many of these are fabulous “little Cote Rotie” Syrahs or “little Condrieu” viogniers like the “La Champine” pictured from serious Cote Rotie/Condrieu man Jean-Michel Gerin. His neighbour Guillaume Clusel is making a juicy Gamay based red from the Coteaux Lyonnais ( pictured = “Traboules”), a little known outpost of Beaujolais actually south of Lyon just before you hit the Syrah slopes. Easy on both the palate and the pocket these wines. All signed up and badged up for the biennial mega Rhone tasting session that is the “Découvertes en Vallée du Rhone” , four days ( April 15th to 18th) of Rhone hedonism in the magnificent setting of the Palais du Pape. With more than 600 exhibitors showing their wines, turning up without a clear strategy of whose wines you want to taste is likely to leave you completely bewildered - where the hell do you start? The event is super well organised have to say and this year hoping to get to a couple of the Matt Walls /Andrew Jefford hosted masterclasses in as well. 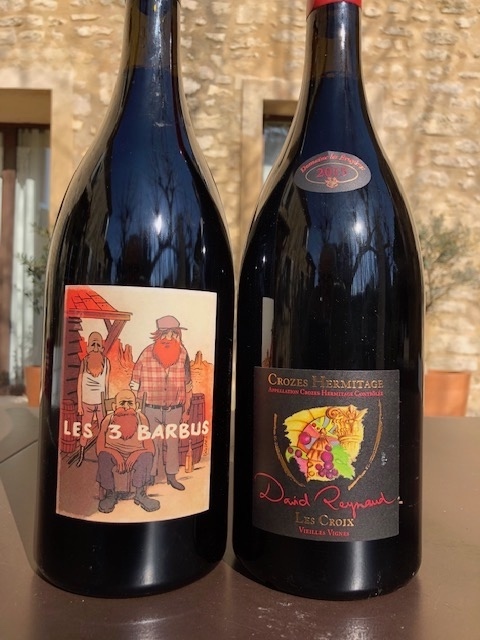 Recently we visited maverick winemaker Stanislas Wallut of Domaine de Villeneuve at Chateauneuf du Pape, we were amused by his label ( “Les Trois Barbus” = bearded ones) for the collaboration he has going with two other bearded gentleman in the Northern Rhone , Mathieu Barret of Cornas, and David Reynaud at Crozes Hermitage, a fine blend of Stanislas’s old vine Grenache and Syrah from the North. 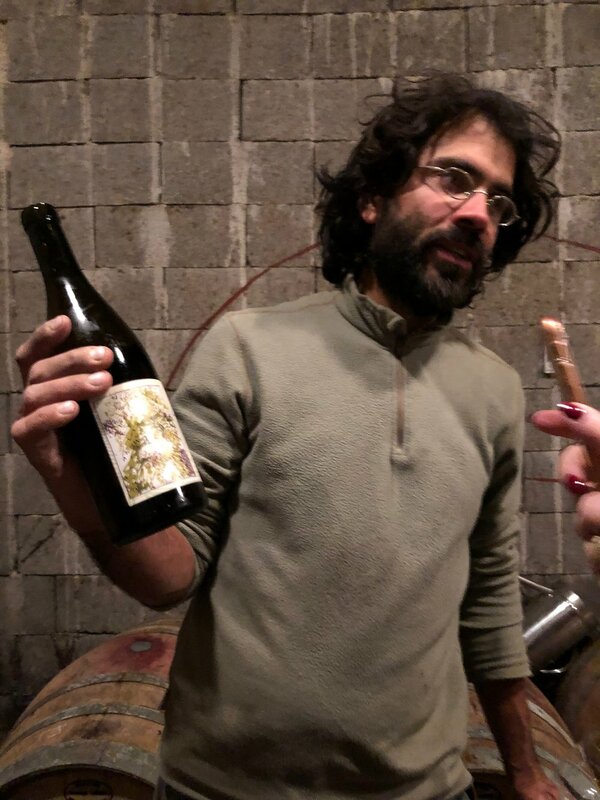 At Stanislas's recommendation I caught up with David last month at his caveau on the plains of Crozes Hermitage – very nice guy, an excellent bio-dynamic producer of Crozes and a very fine looking beard to boot! Last week we took our guests out for another of our seasonal ( January or February) Truffle & Wine tours - really lucked out yet again with the weather , bright blue skys and no frost to deter the dog, Junior, from doing his work - found more than 400g in around 50 minutes ( and at €800 per kilo thats good going!). With Nicolas Monnier’s fab truffle cooking , a slap up 5 course truffle dinner at Fleur Bleu ( merci David) , and winery tastings at Solitude, Escaravailles, Saint-Amant and with an “on great form” Philippe Gimel of Saint Jean du Barroux ,a good time was had by all. Many of my Rhone Wine Tour guests will remember me acclaiming what I call “over the motorway” wines made by Chateauneuf du Pape producers, the wines given humble Cotes du Rhone designation as they are from grapes grown on the land just “over the motorway ( the A7 to be precise) from the illustrious Chateauneuf terroir of their owners – examples are Beaucastel’s Coudolet, Janasse’s Terre D’Argile, the Vielles Vignes from Cristia etc. 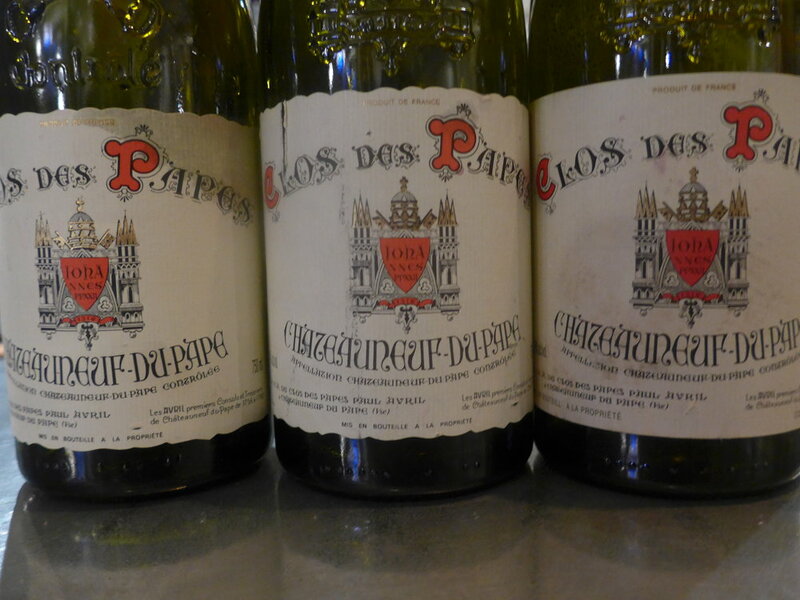 These are invariably wines that punch well above their weight showing much of the character of a Chateauneuf for a fraction of the price, after all almost identical terroir, same climate, same fanatical attention to quality from the wine maker….a bargain for those in the know. Well, the other day I came across this little gem which must be the Northern Rhone’s equivalent -a simple Cotes du Rhone ( a Syrah dominant Syrah/Grenache blend) from the great (greatest?) Hermitage producer J L Chave -the name of the cuvée”Mon Coeur”. This a very serious CdeR, dark mature black fruit, big ripe tannins and lovely glossy smooth mouthfeel, the 2013 absolutely ready to drink now. A bottle of Chave’s famous Hermitage is going to set you back a pretty penny – at least €240 a bottle. The Mon Coeur costs £13.50 ( £162.00 per case) at Rhone specialist merchant Yapp Brothers in the UK. Bargain, enough said! Kicked off the Christmas specials with these beauties on Christmas Eve: the house Larmandier-Bernier “Vertus” 2009 Champagne, steely mineral gorgeousness to get going, one of my fave Condrieus from Christophe Pichon; a Santa Duc Gigondas “Prestige des Hauts Garrigues”2007 – still very young, dark and brooding; two great CNPs – Mont Redon ’98 and Jaufrette ’06, the latter actually the more successful of the two wines in spite of the reputation of the vintages. Happy Christmas drinking to all our friends!